Norman's top-secret research on the American Son project was not the only hidden experimentation that he was doing during his time as the director of H.A.M.M.E.R. 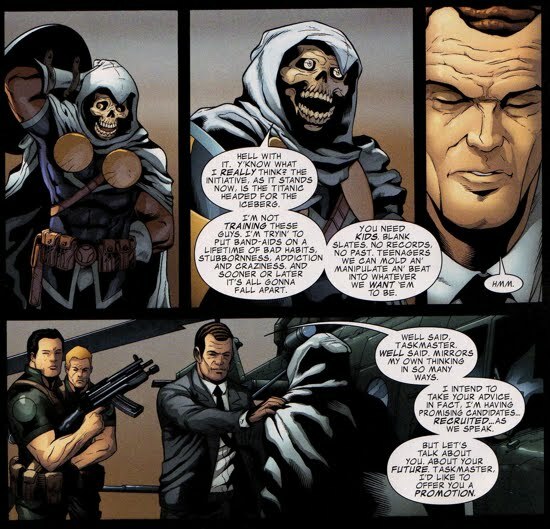 In Avengers The Initiative #31, Osborn alluded to the Taskmaster that he was in the process of recruiting promising young candidates to enroll in his new Initiative. But Osborn's definition of 'recruiting' certainly differs from most because the candidates he spoke of were subjected to various levels of torture and exploitation. 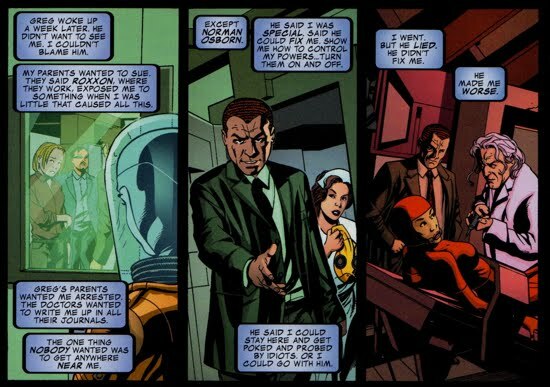 However, when Osborn was deposed from power, all this research stopped and the recruits were taken in by Hank Pym and enrolled in the Avengers Academy. This academy was devised to train young super-powered individuals to use the power sets wisely and become positive contributors to society, similar to Professor X's work with the young X-Men. The initial roster of the Avengers Academy consisted of Finesse, Hazmat, Mettle, Reptil, Striker and Veil, while their instructors were Hank Pym, Tigra, Quicksilver, Speedball, and Justice. The interesting caveat for these new heroic recruits was that they were not profiled to be super heroes at all, rather super villains. Norman had recruited those that he thought would best suit his agenda, so he sought these candidates out. They were then enrolled into the Avengers Academy because Pym and the others feared them and their power-sets and wanted to preempt their descent into a deplorable career. Norman personally recruited each of the candidates, this section will focus on his initial interactions with them and their later confrontation with him whilst imprisoned at the Raft. About three months prior to Norman's siege on Asgard, Veil (aka Madeline 'Maddy' Berry) had a remarkable discovery about her incredible powers after she spontaneously sublimed in the hallways of her high school. Shortly after, Norman paid a visit to Maddy at her home and informed her that he could help her use her powers to become a true super hero like Ms. Marvel. She explained that she could not control her sublimation, but Norman reassured her that he could figure out how she could do so. Maddy accepted Norman's offer, but soon realized that he was being quite deceitful. Instead of helping her, Norman subjected her to torturous conditions with the goal of unleashing her powers fully, and the forced physical transformation that she endured had detrimental affects on her. Once at the Academy Pym apprised her of the terrible news, because of Norman's experiments her body was slowly losing cohesion and that she was slowly dying. Maddy truly regretted the day she met Norman Osborn. A dreadful incident with a cute boy led Hazmat (aka Jennifer Takeda) right into the laboratory of Norman Osborn. Jennifer's kiss forced her boyfriend into a coma because of the neurotoxin she unknowingly exuded from her body, her parents immediately blamed Roxxon (the company they both worked for) for having exposed her to something that created this problem. Regardless of the origin, nobody wanted to deal with Jennifer and everyone feared, everyone except Norman Osborn. He welcomed Jennifer with open arms and, like Maddy, he promised her a cure for her condition. But he lied to her as well, under the feigned motive of helping her to control her power, Norman made it worse turning her into a humanized weapon of mass-destruction capable of wiping out an entire city block with her neurotoxin. Hazmat would eventually seek revenge upon Norman. Norman Osborn first got wind of Mettle (aka Ken Mack) after Ken had suffered a nearly fatal accident while surfing in Hawai'i. Mack was hit head on by another surfer's board and the resulting gash revealed a layer of his metallic skin. Ken somehow landed into Norman's custody, most likely because he was in power and probably promised to heal him as well. Regardless, Osborn noticed that the trauma from the surfing incident accelerated latent power that allowed his body to transform into solid metal. Norman took that information and found a way to convert his entire body to metal, a seemingly irreversible process. 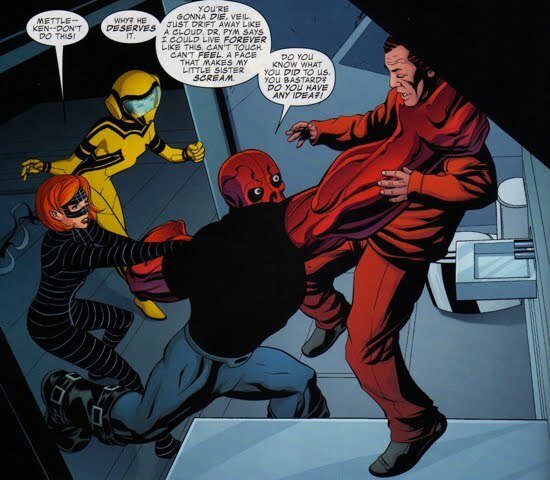 Like Veil and Hazmat, Mettle would also have an axe to grind with Norman Osborn. Reptil (aka Humberto Lopez) was manipulated by Osborn in a more unique way than some of the recruits. Osborn led Lopez to believe that his parents were still alive (its unclear whether they were or not, but Osborn did not know their whereabouts), a trap that led him right into Osborn's web. Reptil, who has the innate ability to transform into a dinosaur (or dinosaur part) that he chooses, managed to escape Osborn's clutches shortly after his attack on Asgard. During that time, Osborn's labs were raided, Reptil was being housed in one them, and he was able to escape. Pym, Tigra and the others were there to aid in his escape and it appeared as though Reptil was able to minimize Norman's influence on his power set. It was not all torture and unnecessary experimentation during Norman's recruiting process, his enlistment of Finesse (aka Jeanne Foucault) was dissimilar to the aforementioned candidates. The mere chance to learn more from Osborn regarding her powers and how to use most efficiently was more than enough to convince Jeanne to follow his lead. Her willingness to embrace Osborn led her to be viewed quite suspiciously by the instructors at the Academy, a reputation she would later earn. Proving to be quite diabolical, she attempted to blackmail Quicksilver into teaching her everything he knew from the Brotherhood of Mutants. No wonder she needed no coercion from Osborn! Unsure of who is true father is, Striker (aka Brandon Sharpe) was forced into the ruthless game of fame-mongering by his attention seeking mother. After an attempt by one of his mother's associates to molest him, Brandon discovered his electric manipulation powers when he fried the perpetrator. Once he realized the extent of his powers, Striker took his show on the road and performed at various monster truck shows and various state fairs. Norman discovered him during that time period and, similar to Finesse's situation, he did not subject Sharpe to any torturous experimentation. 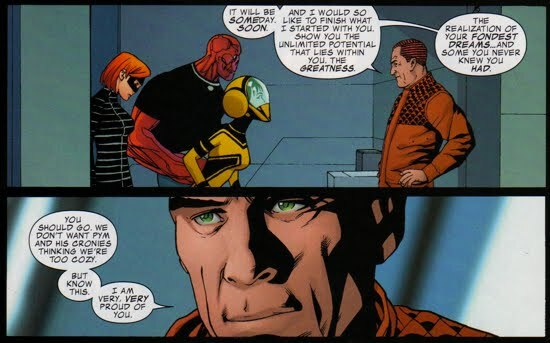 Osborn gave Striker quite the opposite treatment, providing him with everything he wanted (money, women, etc) all the while promising him that the will soon have his chance in the spotlight. But that day never arrived because Norman was soon removed from power and Sharpe was then brought into the Avengers Academy. Sharpe, like Foucault, most likely held Osborn in high regard because of his generous behavior toward them as his recruits. 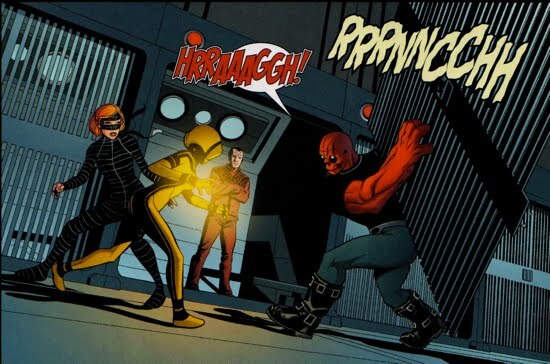 Hazmat, Mettle and Veil obviously felt differently about Osborn and they would soon get their chance to exact revenge upon him during a trip to the Raft. Hank Pym had hoped that exposing his class to criminals would go a long way in preventing them from ending up like the inmates. But the trip would not go as planned, and soon after the group arrived at the Raft for their 'scared straight' tour in Avengers Academy #3, Hazmat used her ability to generate an electromagnetic pulse (a power Pym and the others were unaware of) to create a blackout at the facility. The diversion that was created allowed Hazmat, Mettle and Veil to make their way to Norman's prison cell unnoticed by the others. Once face-to-face with their 'creator', Mettle ripped the bar's from Norman's cell and strangled him up against the wall. However, Norman did not waver at their show of aggression and he calmly reminded the group of the incredible service which he had provided for them. He claimed to have given the trio the means to control their destiny and that, unlike Pym, he had no plan of exploiting them. 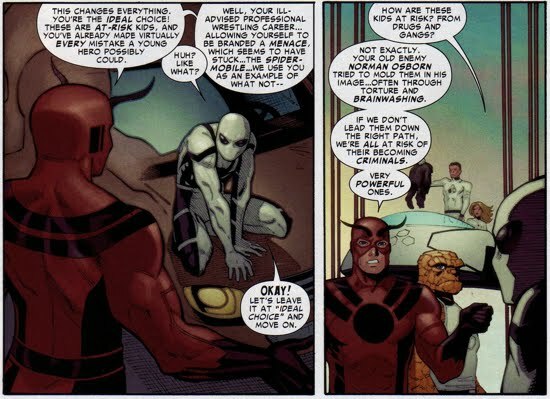 Osborn then implied that Pym most likely had the cure for the current states and was only withholding it to keep leverage on them. Norman then insisted that he could fix them and that he wanted to finish what he had started. The three recruits were confused and their goal of simply killing Norman no longer seemed feasible, and Norman sensed the hesitancy. 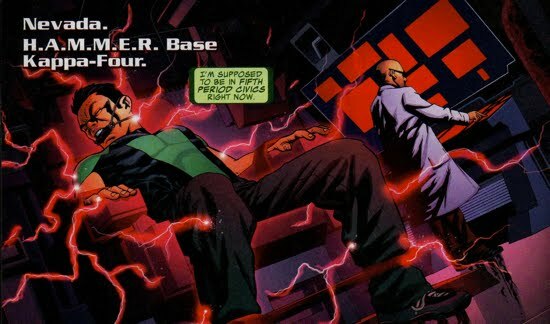 Norman then instructed the group to leave him, because he did not want their superiors suspecting an alliance between their students and the notorious Norman Osborn. Veil, Hazmat, and Mettle did not know who to trust and after leaving Norman's cell, the desire to think of him as the enemy was not shared uniformly between them. Soon after the students went after Osborn, Pym and Tigra deduced their location and quickly made way to Norman's cell, but the students were gone. 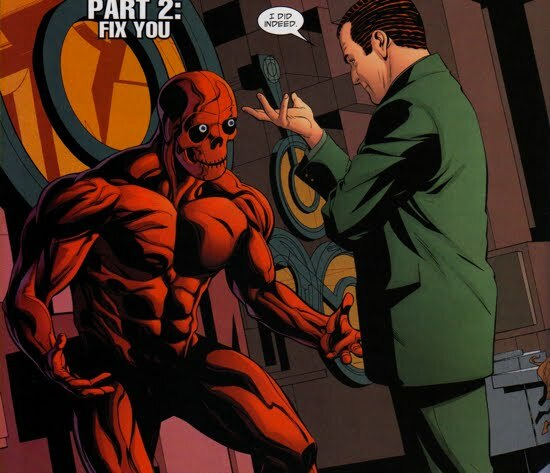 Pym attacked Norman regardless, as Norman played the victim card and informed Pym that the students attacked. Despite being behind bars, Norman continued to have a negative impact on the lives of his 'recruits'. Norman would soon be transferred from the Raft and his affect upon the lives of the 6 students at the Avengers Academy was far from complete. Later, in Amazing Spider-Man #661 Hank Pym attempted to recruit Ben Grimm (aka The Thing) to be a guest-teacher at the Avengers Academy. While Grimm waffled over the offer, Spider-Man jumped at the chance to work with the group of young super heros and Pym graciously accepted Spidey's notion. Spider-Man's desire to help these youngsters was greatly enhanced after Pym informed him that Norman Osborn had tortured (and, in effect, created) these students in an attempt to bend them into his image (and will!). Certainly from Peter's perspective the idea of Osborn training super-powered apprentices would be an absolute nightmare. 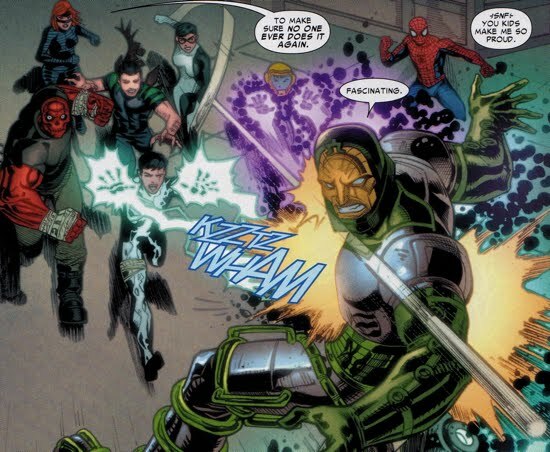 During one of Spidey's first sessions with the Avengers Academy, the group was attacked by the villain Psycho Man. In Amazing Spider-Man #662, Spider-Man and the students work together to defeat Psycho Man, after which Spidey (and the students!) decided that teaching was no longer in his repertoire. 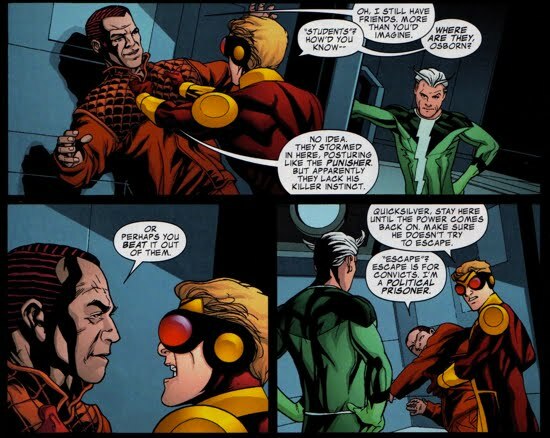 Additionally, Osborn's tenure as the head of the peace-keeping task force H.A.M.M.E.R. led him to be called in as a witness in the trial of Bucky Barnes (aka The Winter Soldier). 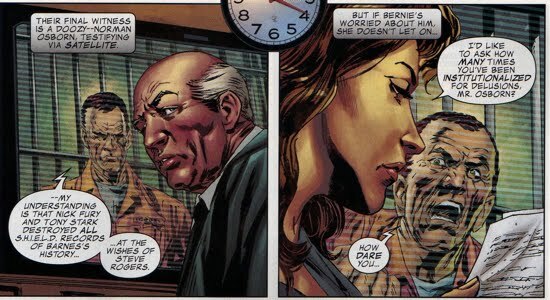 In Captain America #614, Osborn was questioned in regards to information involving Barnes's history. Barnes's defense attorney, Bernie Rosenthal, was able to quickly debunk Osborn's claims because of his prior history of being institutionalized. It was not clear when this occurred (ie, while Norman was at the Raft or the S.C.C. ), but one might assume it was prior to his transfer to the S.C.C. since that was a very secret and secure prison.